Thinking the following “Directions” developed by F.M. 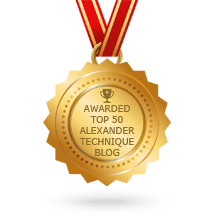 Alexander will help you find more ease and spinal length. Think the Directions versus trying to do them. Think them in sequence. The startle pattern, which is our most usual source of unpleasant tension, begins in the neck. To melt a startle, you need to start by freeing the neck. The word “let” is very important since it implies allowing and non-doing. You don’t want to make an effort with your thought. Thinking too hard will cause you to tense involuntarily. A bit of philosophical text to contemplate while practicing yoga on a sunny winter morning in San Francisco. Once upon a time, I had a boyfriend who would linger at the end of a movie through all the credits. He was in a transitional space – not quite out of the movie, not quite back in the story of his life. I was not allowed to talk to him, or even touch him, lest I break the spell. We get to see the effort we put into maintaining our stories when we practice Alexander Technique or meditation. We hear ourselves think, “I carry tension in my shoulders,” and realize that we can set it down. Sometimes, the internal story is shocked quiet when we encounter great art, great beauty, or great tragedy. The transition is effortless. In the aftermath we perceive something else. What happens after your story? https://www.bodyproject.us/wp/wp-content/uploads/2017/07/logobg.png 0 0 Elyse Shafarman https://www.bodyproject.us/wp/wp-content/uploads/2017/07/logobg.png Elyse Shafarman2014-01-27 04:20:492018-05-13 01:15:24"The world is like the residue left from the telling of a story..."
Researchers in the UK used computer analysis to show that texting while walking causes hunched posture, loss of balance, and an inability to walk in a straight line. Heh! I’m sure you didn’t need science to tell you that. Anyone who texts is familiar with the ‘forward and down’ head posture. This posture can add 30 pounds of extra weight to the delicate neck vertebrae. Discover the joint where your head and neck join. This joint, called the atlanto occiptal joint, is located between your ears at the level of the roof of your mouth. Now imagine adding some oil. See how smoothly and lightly you can nod your head without pushing your neck forward. Take a hold of your phone. But wait! Keep it down by your side. Notice your impulse to crouch down. Think up, as though you had an arrow pointing from the crown of your head to the sky. Rotate your palms forward, so your thumbs are sticking out away from your body. To bring your phone up to eye level, bend your elbows. To see the screen, nod your head gently at the atlanto occipital joint. Think up, and tell your neck to stay relaxed. Now you’re ready to text! Spotted – Episode 8 – Orange is the New Black, the amazing Danielle Brooks (aka Taystee Jefferson) and her side kick Samira Wiley (aka Poussey) do not pull their heads back when they stand up. The classic tell that they’ve had Alexander Technique lessons. I knew it! But, how else would I know? Actors with Alexander Technique training are usually marked by an invisible/visible quality of ease. They move naturally. The voice is not strained. They have the flexibility to portray characters that do not match their physical type. Like Danielle Brooks, artistic expression flows easily – fresh, fluent and deep. Google confirms that Danielle and Samira are graduates of Julliard, where acting students get four full years of Alexander Technique. I will comment, that as much as I enjoy Mindful eating, I’m also a big fan of Brian Wansink’s Mindless Eating…. Wansink does not give eating advice based on ideals of mindful-awareness, health or even nutrition. Wansink researches actual eating behavior. The outcome of Wansink’s research is a series of small, ingenious environmental adjustments you can make to control your eating behavior — without thinking about it…i.e. mindlessly. If you want to eat less, serve the food on a plate in a contrasting color. A cup of white fettuccine on a white plate will look like less food than the same cup on a contrasting red plate due to an optical illusion (Delboeuf illusion). How much of a difference does this illusion make? People with white plates served themselves 22% more pasta than people with contrasting red plates.